Health Coach Jobs | Health Coach Resource: Day 23 of 30 Days of Hope and Inspiration: Erich is Amazing! Day 23 of 30 Days of Hope and Inspiration: Erich is Amazing! Erich celebrated his 23rd birthday last month AND his remarkable weight loss of over 100 pounds!!! We are all so proud of him and happy for him. In addition, he has chosen to "pay-it-forward" by coaching others to better health too. The change is not limited to body size, the ability to get around or reduce pain and medications. The transformation occurs on every level - physical, emotional, and financial. If someone you care about is finding that carrying excess weight is negatively impacting their ability to find and keep a job, share my info with them and give me a call! 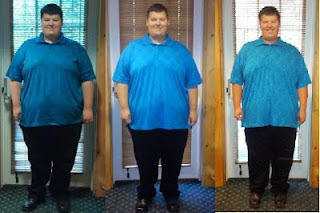 Congratulations to Erich for his remarkable wight loss and his commitment to pay it forward.